Let’s face it, there are some things that we just do not need in the body of Christ. Frivolous debates that have the body so splintered and fractured and broken that those in the world cannot recognize the difference that should be found in the lives of a believer. 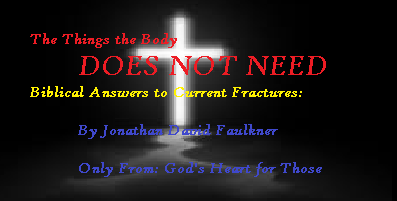 This series is designed to discover biblical answers to some of those fractures and bring reconciliation and unity to the Body of Jesus Christ. It is not meant to spur any further debate or anger but to encourage and built up the body. Understand that I am by no means the authority on these matters, I have seen these issues and wish to address them for the betterment of the people of God. Part 5: The Things we DO Need.